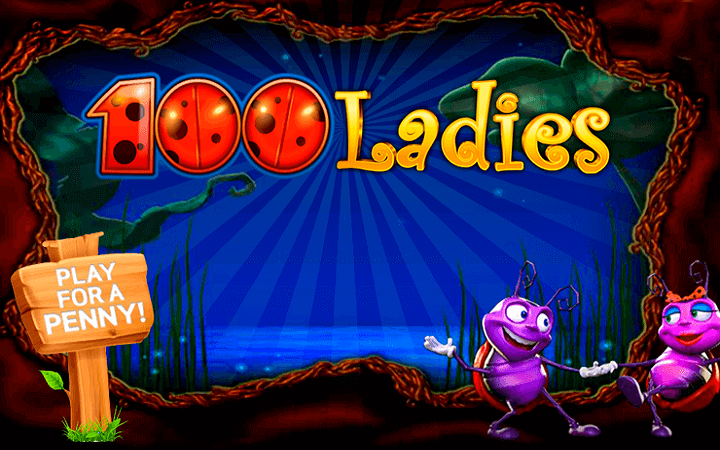 Before you start to get funny ideas, we must say that 100 Ladies casino slot game is filled with ladybugs, not the other kind of ladies. IGT online slots developed a simple yet entertaining video slot game this time, the theme is about “mother nature”. Graphics quality is at basic levels and consists of hand-drawn symbols, but it looks nice and suits the theme very well. There are no 100 ladybugs in the game, but it has 5 reels and 100 pay lines. An unusual amount – but your winning odds are much higher because of this value. 100 Ladies online slot game by IGT has ten symbols in total and half of them are high-valued. These are shown with pictures of different ladybugs and sunflowers; with a payout range of 25 to 1.000 coins. The rest are in the form of numbers and letters and they have low payout values. Rules are very simple and there aren’t many. A picture of a group of ladybugs counts as the wild symbol. Wild substitutes all other symbols, except the Bonus (scatter) symbol. It also has a payout value of 1.000 coins – wild is the most valued symbol in the game. Scatter symbol is shown with a big Bonus sign. Landing three scatter symbols on reel 3 will award you with 10 free spins and pay 2x the total bet. During the feature, all symbols change colors but their payout values stay the same. This feature can get re-triggered, land three more scatters – get 10 more free spins. And that’s it – these are the only special symbols you need to know about in the game. It is suited for people who likes to play casino slots online with simpler themes and rules. game – practice first, risk later. The line bet values change between 1.00 and 20.00 coins. To play with the maximum bet amount, you need to risk 2.000 coins. The game also has a support for automatic spins. This is a nice, casual slot game but IGT slot series can offer much more. Try it on a rainy day!